It started with the rush to the keyboards and microphones: "Attention everyone: Kennedy was a good Catholic as well as being a good Liberal"
I think the yardstick being used here is that Kennedy was successful in exploiting his Catholic identity to achieve his liberal political agenda. There's a certain tone of admiration and triumph that he wasn't officially criticized by the Church and never denied the platform when he sought it to speak as a Catholic. What would I believe a good Catholic politician would do? It isn't a matter of taking orders from a bishop but letting the teachings of the Church permeate how you think and act. Why? Because Catholics believe that the Church speaks for Christ, and especially so when it declares an intersection between important universal moral teaching and public policy. The "Kennedy is a good Catholic" advocates either ignore this or respond -- "look at the whole man". This could be your standard or mine, but it not God's. Cardinal O'Connor made the point to several New York politicians, that sanctions from the Church were secondary to the peril that you risk ones own salvation by advancing, even in a remote way, the murder of the unborn. I would be moved by that. The "Good Catholic" label given by pro-choice liberals may be permanently retired. Born in 1932, Kennedy may have been the last politician who sought and who had a distinct appeal to Catholics. The Catholic voting bloc doesn't exist in 2009. As political creatures, we are all assimilated now into the American voter. Partly because of demographics and partly because what might be called an "Catholic agenda" can't be identified apart from the "Democratic Party agenda" apart from the right to life issues. The threat of losing its tax exempt status is the muzzle stifling the Church's voice. Many questions come up and when the Church has a clear teaching on a serious moral matter, I withhold the "good Catholic" label from the politician who opposes and undermines it. It's no longer about Ted Kennedy now. He exists in eternity now without rank, money, or privilege but in God's mercy. It is about us and whether we can, as Catholics, pull the voting levers for Catholics who promote a disregard for the culture of life, and can justify that choice as we appear before the same merciful God who has judged the late Senator. It was the year he was serious about running for President of the United States -- 1980 -- President Carter was running for reelection but he first needed the nomination of the Democratic Party. (details on the Wikipedia). Kennedy (then 48) was known for being a Senator (appointed in 1962 at the Constitutional minimum age of 30), for Chappaquiddick in which Mary Jo Kopechne died in mysterious circumstances, and for a Roger Mudd interview where he fumbled the question "Why do you want to be President?" All of the early primaries were won by Carter but as 1980 progressed, people thought he was not handling the economy and Iran hostage crisis well. There was high unemployment, high interest rates, and all over the globe, the power and influence of the Soviet Union was growing. Kennedy confidently came to New York, to Queens, to Woodside, to the SE corner of 58th Street and Roosevelt Ave. to Sunday Mass at St. Sebastian. I was 26, and married a year, and I shook the Senator's hand, along with many other Woodsiders on the week of the New York primary. He won New York, but that was Kennedy's peak, and by the time of the convention Carter had a surge. Kennedy never again sought the Presidency. 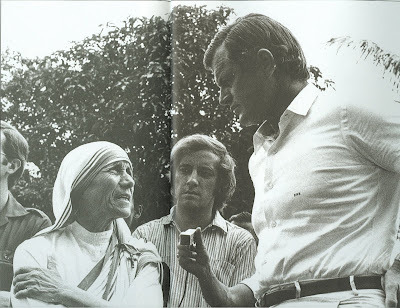 This undated photo of Mother Teresa and Senator Kennedy was taken in India. Taking a step back, the liberal Catholic love for Kennedy is no surprise. The surprise is burying his pro-abortion record in pieces targeted towards Catholics. The related surprise is the intensity of the attacks on pro-life Catholics who point out the plain fact that Kennedy was pro-abortion. Pat Madrid has written what I feel. I will have more to say about the late Senator later. Where did the idea of "positive rights" enforceable by law become popular with the Catholic Church? It takes some capital and labor to provide health care, education, clothing, food, shelter. These are essential for all, and the purpose of alms is to make a provision for people unable to purchase from their own wealth to obtain them. I can understand committed socialists like Obama to advocate nationalization of health care as consistent with federal control of the economic life and liberty on the installment plan -- but why has the Church been so enthusiastic to embrace a federal bureaucracy -- one committed to promoting abortion, euthanasia, cloning, and rationing of health care. I know ACORN is funded by the Campaign for Human Development which in turn is funded by donations collected at Mass from Church-going Catholics, but that's not even a significant part of the Church. Yet it seems all of the agencies of the Church with involvement in health care and the alleviation of poverty are on board with Obamacare and "positive rights".